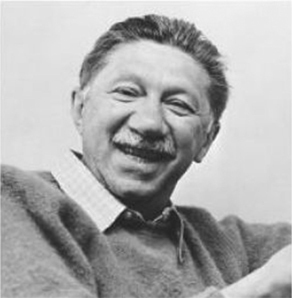 The American psychologist Abraham Maslow (1908-1970) was born of uneducated Jewish immigrant parents from Russia, grew up in Brooklyn before going on to attend City University of New York, then graduate school in psychology at the University of Wisconsin and Columbia University. He became a very original thinker, interested in taking psychology beyond its first “two forces,” Freudian theory and Behaviorism, and their obsession with psycho-pathology. His research eventually led him to found the Association for Humanistic Psychology in 1959. And, then, going a quantum leap further, he established the Association for Transpersonal Psychology in 1969. Maslow thus called his Humanistic Psychology the “third force” and Transpersonal Psychology the “fourth force” in the field of psychology. Humanistic Psychology wants to examine what is really right with people, rather than just what is wrong with them. That is to say, it wants to focus on psychological health and well-being rather than merely on mental-emotional-behavioral disorders. Going much further, Transpersonal Psychology is interested in exploring extreme wellness or optimal well-being. It is interested in those cases of persons who have often or perhaps permanently expanded their “normal sense of identity” to include the supra– or trans-personal, the Self of all selves, the One underlying the Many. Transpersonal Psychology explicitly acknowledges and makes use of the profound spiritual psychologies of the Great Traditions (Hinduism, Buddhism, Taoism, mystic Christianity, Judaism and Muslim Sufism), as well as new insights and methods in the human potential and consciousness-expanding movements. Maslow articulated such key concepts as “self-actualization” (development of one’s capacities) for Humanistic Psychology, then exceeded it with his Transpersonal Psychology ideal of “self-transcendence” (full spiritual awakening or liberation from egocentricity), along with the notion of “peak experiences” (and “plateau living”). Frager, R. and Fadiman, J. eds. Personality and Personal Growth, 6th ed. London: Pearson, 2005. Maslow, A. The Farther Reaches of Human Nature. New York: Viking, 1971. Walsh, R. and Vaughan, F. Paths Beyond Ego: The Transpersonal Vision. Los Angeles: Jeremy Tarcher, 1993.